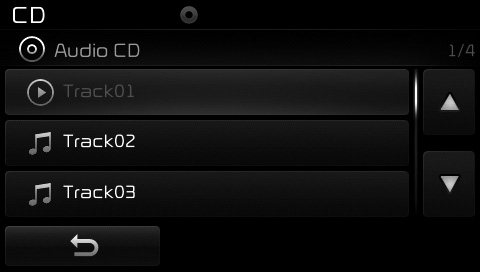 Once an audio CD is inserted, the mode will automatically start and begin playing. The artist and title information are displayed on the screen if track information is included within the audio CD. Press the key to move to the previous or next track. Pressing the key after the track has been playing for 2 seconds will start the current track from the beginning. Pressing the key before the track has been playing for 1 second will start the previous track. Turn the TUNE knob left/right to search for the desired track. 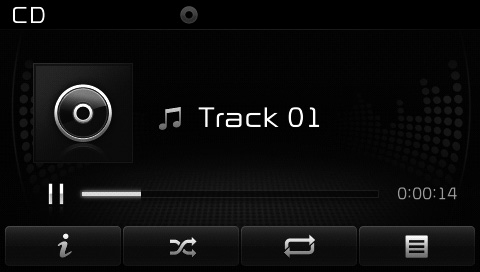 Once you find the desired track, press the TUNE knob to start playing. While playing, press and hold the key (over 0.8 seconds) to rewind or fast-forward the current track.